Please ensure that you complete the application form in full. Many applicants do not complete the application form correctly, or do not provide all the supporting information. This means an application that usually takes 4-6 weeks may take twice as long to process. Provide full mailing and business details in section 1. Specify the type of scheme you wish to apply for in section 2. For Lead Auditor applications, compliance to all of the Auditor requirements must also be demonstrated. Specify your technical and academic achievements in section 3. This may include degrees, diplomas and short courses. Section 4 requires your membership of professional bodies if any. Please provide documentary evidence as applicable. A SAATCA approved Auditor / Lead Auditor training course and examination as applicable to the scheme applied for must have been successfully completed by all applicants. This must be specified in section 5. Your work experience and its applicability to the scheme being applied or must be stated in section 6. Even if applicants attach a CV to the application, completion of this section is mandatory. This ensures ease of evaluation by the evaluation committee. Obtain signatures from your manager, proposing your certification in section 7. In cases where an applicant is not employed by a specific organization, two sponsors who have a business relationship with the applicant need to sign this section. All certificates submitted as documentary evidence must be certified by a commissioner of oath as authentic. Audit log sheets must be completed for each audit and must be submitted on the SAATCA SF26 Audit Log form. Only submit sufficient audits to demonstrate compliance with the relevant scheme criteria. Only audits carried out after the Auditor / Lead Auditor training will be accepted. For Auditor and Lead Auditor grades, an evaluation report SF45 must be completed by a registered SAATCA Lead Auditor as applicable to the evaluation of an audit listed in the Audit Log. On receipt of an application the SAATCA office will issue and invoice. The application will only be processed on confirmation that the application fee has been paid. This is separate from the certification fee which will be payable when your application and grade has been approved. Please refer to Certification Fees. Administrative check to ensure that all the forms are fully completed and all supporting information is correct. Submission to the SAATCA Evalaution com Board for review and approval. Integrity review by the Certification Manager ensuring that a fair and impartial review was carried out. Notification of approval and issue of the card and certificate. Should your application be rejected for any reason, you have the right to an appeal. All appeals are handled by an independent committee who investigates your case and will communicate their decision directly to you. To lodge an appeal, please click the following link for Incident Form, you may also contact the SAATCA office to request the relevant documents. In order for SAATCA to demonstrate pro-active monitoring of competence in terms of the requirements of ISO/IEC 17024, all registered auditors are required to provide proof on an annual basis that their certification is maintained. This is done annually by the auditors to demonstrate Continual Professional Development (CPD) and by submitting Audit Logs for audits carried out in the field relevant to the scheme. See CPD Policy. A registration card will be issued each year. Refer to the relevant scheme criteria that provide details and requirements for maintaining certification. For more information please refer to the SAATCA communiqué on updated requirements for Annual and 3- Yearly registration SF107. 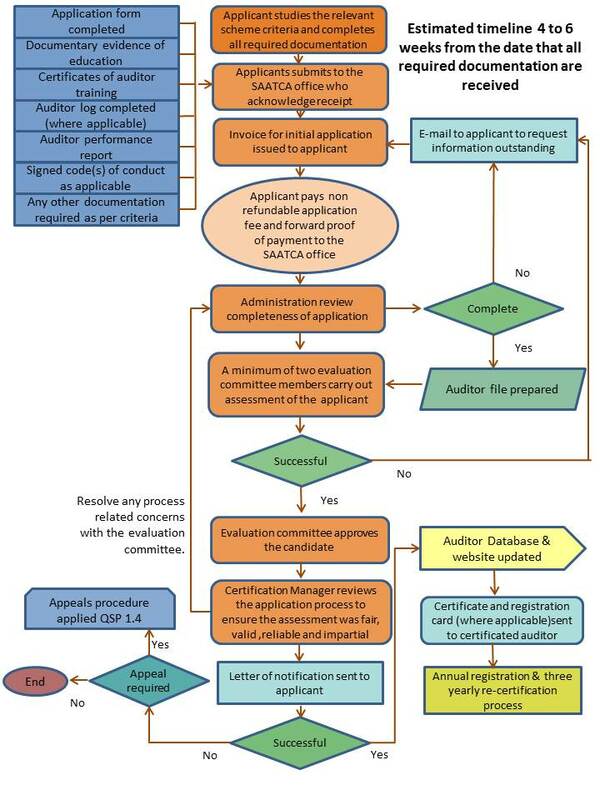 Re-certification involves an evaluation by the Evaluation Committee of the Continual Professional Development and Audit Logs submitted over the past 3 years. For more information please refer to the SAATCA communiqué on updated requirements for Annual and 3- Yearly registration SF107. If successful, a new certificate will be issued, indicating the expiry date of the next 3 year cycle.